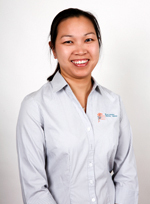 Wynne Yip joined Blackburn Dental Group in 2006 after having worked in various disciplines of dentistry since she graduated in 2000. She has been a clinical demonstrator/supervisor in the undergraduate teaching clinic at the University of Melbourne as well as the LaTrobe University Dental School in Bendigo. Over the years, she has participated in many dental health promotional events. In more recent years, Wynne has been involved as a volunteer with the Royal Flying Doctor Service in the provision of dental treatment to communities in remote areas of Victoria. Wynne is a member of the Australian Dental Association and the Australian Central Association of Dentists. She actively takes part in continued education courses on a regular basis. Her special interests are paedodontics (children’s dentistry), oral rehabilitation and cosmetic dentistry and Cerec CAD-CAM restorations. Wynne is fluent in Chinese (Cantonese).